The Los Angeles Chargers earned a 30-10 win over the visiting Oakland Raiders to end their 2017 campaign on a positive note in StubHub Center on Sunday. Chargers quarterback Philip Rivers leaned on his star wide receiver Keenan Allen early and often, as the two connected for 133 yards and one touchdown. Allen’s nine receptions also pushed him ahead of Hall of Fame running back LaDainian Tomlinson for most receptions in a season (102) for a Chargers player in franchise history. Raiders running back Marshawn Lynch was the lone bright spot for the Silver & Black, as Beast Mode rushed for a team-high 101 yards on 19 carries. While the Raiders had multiple coverage busts during the game, Rivers did take advantage of Oakland’s struggles. The Chargers QB completed four of his six deep pass attempts (20-plus yards in the air) for 166 yards and two touchdowns. 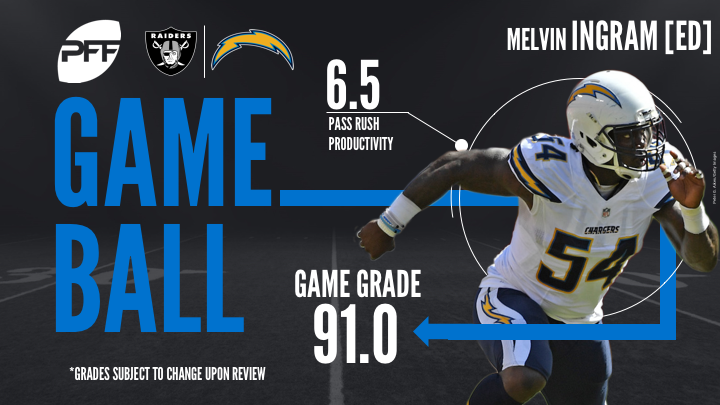 In addition, Rivers utilized his quick release to help his offensive line and also had a passer rating of 125.8 when he attempted a pass within 2.5 seconds. Benjamin proved to be Rivers’ best deep target against the Raiders, as he hauled in two deep passes for 83 yards and a touchdown on Sunday afternoon. Furthermore, Benjamin caught all four of his catchable targets, while Rivers had a perfect passer rating of 158.3 when throwing to him. Ingram appeared to be unstoppable against Oakland as he took advantage of the absence of left tackle Donald Penn. Ingram picked up three total pressures – including a sack – on 28 pass rushing snaps while he also beat his blocker on multiple other occasions just to see quarterback Derek Carr release the ball before Ingram could get to him. While Bosa was not as unstoppable rushing the passer as Ingram, he wreaked havoc on run plays against the Oakland offensive line, as he picked up two defensive stops on the day. In addition, just like Ingram, Bosa picked up three pressures – one sack, one hit and one quarterback hurry. While Lynch ran for just 101 yards, this was one of his better performances in his first season as an Oakland Raider. The former Seattle Seahawk had to fight for every yard, as he gained 79 of his 101 yards after contact and averaged 4.16 yards after contact per attempt. Furthermore, Lynch also broke a total of six tackles on his 19 runs. Although Cooper did not have a lot of success against Chargers CB Casey Hayward, he did prevent a couple interceptions on several ill-advised throws by Derek Carr. Also, Cooper provided Oakland’s offensive highlight for the game when he split the coverage of a safety and a cornerback and took advantage of their miscommunication to take a deep pass to the house for 87 yards. Bowman capped off his relatively inconsistent season with one of his best performances of the year. As a result, the former 49er had an impact on all three facets of the game, as he excelled in run defense, contributed in pass rush and held his ground in coverage. Even though Bowman did allow four receptions, they went for just 37 yards. In addition, he led his team with four defensive stops and also recorded a sack. Even though Mack was kept without a sack or hit for just his fourth time this season, he did have some success rushing the passer, picking up two quarterback hurries. In addition, Mack set the edge against the Chargers’ runs, as he picked up four defensive stops and was among the Raiders’ best run defenders.